Golden Orb Tours is a tour and activity company based in Plettenberg Bay, South Africa, and owner Gareth Robbins is committed to off-setting his carbon footprint by donating R1/km of his guided hikes to a research or education organisation - read more here. 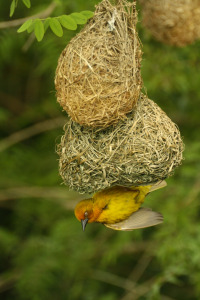 This year Golden Orb Tours will donate this money to PHOWN (Photos of Weaver Nests), a project of the Animal Demography Unit to study the variation in colony sizes of weavers and the breeding distribution of weavers. For birding or hiking along the Garden Route, contact Gareth. Gareth has also contributed several PHOWN records - see here. Photo (right): one of Gareth's Cape Weaver PHOWN submissions. To donate to the ADU's weaver research, see here. How are you off-setting your carbon footprint?